Out of the horror inflicted by those who cannot accept the world as it is, comes a vision of a better world. It comes from above and it comes from below. It comes from ordinary people. Supermarkets in Wellington suburbs have sold out of flowers, tough old football coaches are talking about love and, most powerful of all, there are the stories of the Christchurch shooting survivors themselves. Those who risked — and lost — their lives to save their fellow worshippers or — astonishingly — found it in their hearts to forgive the gunman. Then there is this 38-year-old woman: the Prime Minister of New Zealand, Jacinda Ardern. We have watched as she shows the world what real leadership is. Jacinda-mania had died down since 2017, when she became the country’s youngest prime minister. She gave birth in office, taking her baby to the United Nations General Assembly meeting. She became something of a celebrity, appearing on US chat shows. But was there any substance to her? That question is asked of all women leaders. What is underneath? Where is the steel? Now, in the most horrific of circumstances, Ardern showed us the steel. We have seen the qualities that define leadership in such a way that it is clear she is a lioness and that to call so many of our current leaders donkeys is a disservice to hardworking donkeys the world over. Her outright rejection of the values of terror was swiftly followed by a promise to tighten gun laws, making sure that costs of the funerals were paid and that there was financial assistance for those affected. The next day, she went to Christchurch, taking leaders of all political parties, not just her own. She stood with Islamic leaders and hugged the grieving. This showed respect and real compassion, and those striking images flew around the world. A counter to the picture of the stubby bullish killer who was still flashing signs apparently to white supremacists. Trump threatens all with the military in his quasi-Mussolini style. While Theresa May could not communicate any of this warmth or leadership in the aftermath of Grenfell. That leadership could be about compassion and that overused word “empathy” feels freeing to us now. It wasn’t always this way. Dwight Eisenhower once said: “The supreme quality of leadership is unquestionably integrity.” Ardern embodies this; meaning what she says, saying what she means, unafraid and unbowed. Martin Luther King said genuine leaders did not search for consensus but moulded it. Ardern has moulded a different consensus, demonstrating action, care, unity. Terrorism sees difference and wants to annihilate it. 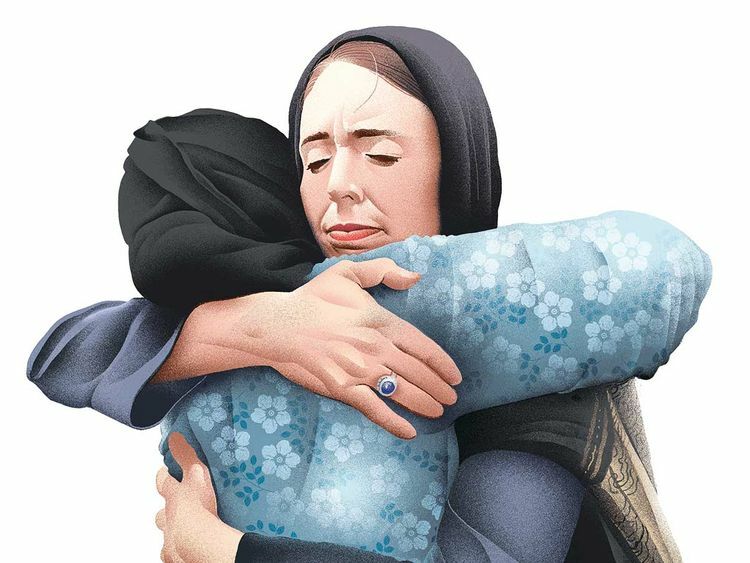 Ardern sees difference and wants to respect it, embrace it and connect with it. Here is an atheist showing that love will dismantle hate. This is leadership, this light she shines, guiding us through to a world where we see the best of us as well as the worst.